Team Diaz Tennis USA lets you perfect your tennis skills at our upcoming tennis camp and clinics. Sign up now to participate! To allow our kids to travel to competitions, we need more support. Your donations will help cover transportation and hotel accommodations. World TeamTennis: Billie Jean Kings, "Delaine Mast Award"
On November 2nd 2018, Coach Jay Diaz was awarded the Delaine Mast Award, for WTT Director of the year. He was invited to Indian Wells CA to recieve this award from the Queen of tennis her self Billie Jean King. Billie was holding the World TeamTennis Recreational Nationals in Indian Wells. Coach Diaz was honored for his association with; San Diego Aviators Pro WTT Team, Coaching and Directing Summer Junior WTT at Barnes Tennis Center, Team Diaz Tennis USA which represents Billie's dreams of High School WTT tennis throughout California, Arizona, Nevada and being Head Coach at Helix Charter High School in La Mesa CA. Jesus “Jay” Diaz of San Diego, Calif., is the 2018 recipient of the Delaine Mast Award, which was established in 1998 by World TeamTennis co-founder Billie Jean King to recognize a League Director who contributes to the growth of tennis and WTT, and acts as a leader and role model in their local tennis community. The award is named after longtime WTT Community Tennis National Director Delaine Mast. Diaz, who took up the sport at age 12, has been an integral part of the San Diego tennis scene for decades. He played competitively as a junior before turning pro at age 19. Diaz left the pro circuit at age 26 and two years later began teaching private lessons which reignited his passion for the sport. Diaz soon joined Helix Charter High School in 2005 as the assistant coach of the girl’s team and boys head coach. In his 12th season with the team, Diaz coached Helix Charter High to the 2017 CIF San Diego Section Division II Girls championship. In October 2018, Diaz was also recognized by the San Diego High School Sports Associations for his squad’s 2017 success. 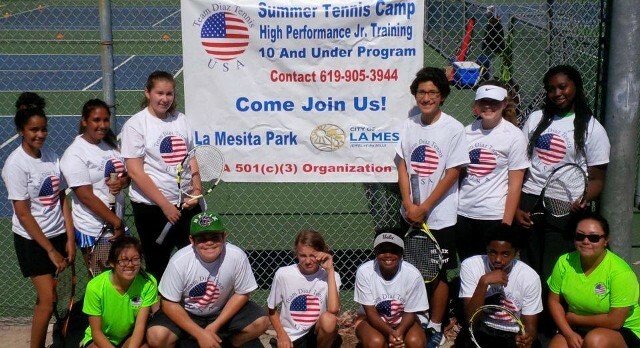 Diaz is president of Team Diaz Tennis USA, a non-profit venture based in La Mesa, Calif., which includes a high-performance tournament training summer camp. Diaz was one of the first coaches to introduce High School World TeamTennis in southern California, growing the coed program from 10 to 24 schools since 2012. His work with Team Diaz and the San Diego area tennis community earned him the 2016 Eugene Jung Multicultural Award from the USTA Southern California Tennis Association. Diaz, a USPTA-certified instructor, has organized and coached high-school age teams at the WTT Junior Nationals for several years. Diaz also works as the Volunteer Coordinator for the San Diego Aviators and also coordinates special events for the team including High School Volleys Against Violence, and theme nights to honor police, fire and military members. Although Diaz has been on the receiving end of numerous accolades from the tennis industry over the past few years, his focus remains on giving back to the sport he loves. “I have been so blessed to be a part of the world of tennis,” said Diaz. On February 1, 2016, Jay Diaz was honored to receive an award from the USTA/SCTA 2015 Southern California Awards Dinner, the Eugene "Gene" Jung Multi-Cultral Award for coaching tennis at UCLA Tennis Center. See photos on the Photos page. At Team Diaz Tennis USA, our mission is to develop junior and collegiate tennis players, while building well-rounded student-athletes by teaching life skills through health and wellness, education, diversity, and inclusion through sport. Our family-oriented environment encourages student-athletes to reach their gonals by embracing daily challenges on the court, in the classroom, and in competition. Our coaching and student services staff is committed to inspiring self-discipline, accountability, ad excellence throughs USA.